ONLY 25 FREE Tickets Left To The World of Outlaws Dirt Bike Races! Are YOU Going?? Do you enjoy dirt track racing? 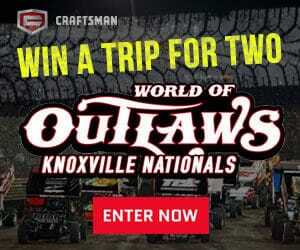 If so, you will definitely want to check out the Craftsman Club for your chance to the win the World of Outlaws giveaway! You could win one of the remaining 25 tickets to races of your choice in 2017! Score FREE TICKETS Through Craftsman Club!! Enter the giveaway is simple. Just enter your name, email address, and phone number. Also, you will need to create a password so you can sign into your account. When you enter the giveaway, you are also signing up to receive to be part of the Craftsman Club. Through the club, you will receive newsletters via email, awesome up close a personal dirt track racing videos, informative blog posts, and of course, a chance to win these awesome sweepstakes from World of Outlaws! Only one lucky winner will be chosen to receive the tickets to any 25 races of their choice. Your odds of winning will depend on the number of individuals who enter. You must be 18 years of age or older to enter, and you must be a resident of the United States. In order to have a chance to win, you must have created a Craftsman membership prior to entering the sweepstakes. The winner will be randomly selected on November 27, 2016, and notified soon after. Good luck! How To Get $250 to Spend At Target By Next Month FOR FREE!! Win a FREE Target Gift Card Worth $250!!! If you like shopping at Target, you have to check out this offer for your chance to win a FREE Target gift card valued at $250 through DailyBreak! If you do not already have DailyBreak account, you must create one for FREE so you can be entered in the Target gift card drawing. If you already have an account, you can simply log in. Then, take the fun and easy Tailgate Quiz. By taking the quiz, you will be able to enter the Target sweepstakes. You will also receive delicious recipes from Oreo and Ritz crackers. Along with the quiz, you have to participate in a Facebook board and on Pinterest in order to enter the gift card drawing. By completing these social engagement tasks, you will also earn a savings opportunity for 25% off your purchase of Ritz toasted chips and Ritz crackers at Target through Cartwheel. Now, the big question remains; if you win the $250 Target gift card, what would you spend it on?? This awesome giveaway offer will not be around for long, so take the quiz, complete the social engagement tasks, enter the gift card giveaway, and get your savings discount. Then, wait to find out if you are the winner! Want To Win An All Expenses Paid Trip to Hawaii? Win An All Expenses Paid Trip to Hawaii With the Travel Channel Sweepstakes! Have you always dreamed of taking a Hawaiian vacation but it was never in the budget? If so, be sure to check out this Travel Channel Sweepstakes for a chance to win an incredible $10,000 vacation in Hawaii. You can enter the giveaway daily from now until September 30. To begin your entry, be sure to enter an accurate email address. Then, enter your name, home address, birthday, and cable service provider. If you are the grand prize winner, you will receive $10,000 to put towards a Hawaiian vacation! Can you imagine those swaying palm trees, the clear blue sea, sand between your toes, and drink in your hand as you relax on the Hawaiian shores? This does not have to be some distant dream if you win the Travel Channel Sweepstakes! You do not need to make any sort of purchase in order to enter this incredible vacation giveaway. However, you must be at least 21 years of age or older to enter. Your chance of winning will depend upon the number of people who enter this vacation giveaway. In order to enter, you must reside in one of the 50 United States or the District of Columbia. A winner will be chosen around October 14, 2016. Good luck! Rock The Lunchbox Giveaway: Enter For A Chance To Win 1 of 24 High Quality School Lunch Items! We are rapidly nearing the end of August. That means that now is a great time to start thinking about back-to-school clothing, school supplies, and school lunches. Right now, you can enter the Rock the Lunchbox giveaway for a chance to win a variety of lunch supplies from Honest Kids, Green Kid Crafts, and more. To enter the sweepstakes for your chance to win, enter your name, email address, and mailing address. Then, submit your submission.Please note, there is a daily sign up limit to 400 entrants. If the giveaway has reached 400 entrants today, be sure to try again tomorrow! If you are winner, you could receive one of the following prizes, a BPA-free Bento lunch box, 32 organic Honest Kids juice drinks, monthly kits filled with craft and science materials, reusable and dishwasher safe Lunchskins pouches, or 20 FREE coupons for Applegate products, Annie’s products, and Rudi’s Organic Bakery products. While you are applying for a chance to win the sweepstakes, be sure to check out the Rock the Lunchbox website for all kinds of great ideas for tasty and simple school lunches that your kids will love. The website even features allergy-friendly school lunch ideas that will suit any child’s special dietary needs. If you have great lunch ideas, you can submit your own and they may be added to the website! You Won’t Believe It – Your Messy Child Can Help You Win $5000 Courtesy of Wet Ones!!! 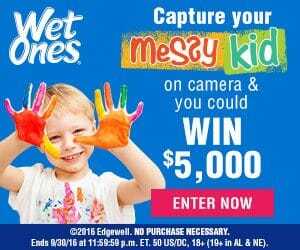 Your Messy Child Can Help You Win $5000 Courtesy of Wet Ones!!! What would you do with an extra $5,000? Does winning $5,000 sound too good to be true?? When you enter the Wet Ones giveaway, it really could happen to you! For a limited time, you can enter the Messiest Kid In America Contest. One grand prize winner will receive $5,000 and a year supply of Wet Ones wipes. Five first prize winners will each receive a $2,500 Visa Prepaid Card. To enter the giveaway, take a photo of your child at his or her messiest! The messier, the better! Doused in dirt? PERFECT! Covered in spaghetti? Even better! Once you have snapped your child’s messy photo, upload it onto your Twitter or Instagram account. Be sure to tag the photo with the hashtags #wishihadawetones and #contest Then, check your Twitter or Instagram direct messages. You will receive a link to claim your photo. You must follow the link in order for your photo to be included in the giveaway. Next, fill out the contest entry form and submit it. If you do not have a Twitter or Instagram account, another option is to upload your messy kid photo directly to the Wet Ones website. In order to enter the giveaway, you must be 21 years of age or older and reside within the United States. This awesome giveaway ends on September 30, 2016. Enter while you can for your chance to win! Enter This Vacation Sweepstakes For Your Chance To Win A Cruise!! Although the end of summer 2016 is rapidly approaching, there is still plenty of take to take a fun summer vacation. However, we all know that vacations can get expensive. What if you could win a fun, FREE vacation?? If you enter this special vacation sweepstakes from BlueGreen vacations, you could win a cruise vacation valued at $4,999! If you are the grand prize winner, you will get to select your cruise destination! How wonderful does that sound?? Your actual chance of winning will vary depending upon the number of people who enter this incredible giveaway. In order to enter this vacation sweepstakes, you must be a legal resident of the United States and you must be 21 years of age or older. You may only enter this giveaway once, and only one person per household can enter. To enter the giveaway, answer a few questions about yourself as well as your mailing address and contact info. You must complete your sweepstakes entry on or before July 31. A winner will be randomly selected around August 15, 2016. If you are the winner, you will be able to take your FREE cruise between the remaining months of 2016 and December 31, 2017. If you win this amazing BlueGreens vacation, where will you want to travel on your cruise?? Good luck! Give Your Child an Expensive Barbie Star Light Adventure Hoverboard Without Spending ANY MONEY When You Enter This Giveaway for FREE!! 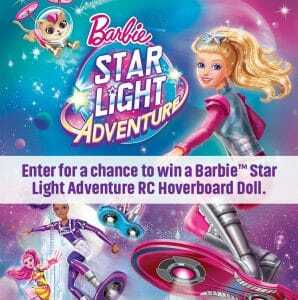 If your child or a child you know loves Barbie, be sure to check out this special Barbie Star Light Adventure hoverboard giveaway offer! From now through July 31 you can enter this awesome giveaway for your chance to win a Barbie Hoverboard. Just like in the movie, this awesome remote-controlled toy flies through the air! It so much fun to play with, and would make a great toy for any kid. Barbie can be placed on top of the hoverboard toy. With the use of a remote control that comes with the hoverboard, Barbie can fly around your house, your backyard, or anywhere a hoverboard can be safely flown! This is such an innovate toy, and every kid will want one! If you win, you could save it for a special birthday or holiday present! To enter the Barbie Star Light Adventure, just click on this link submit your name and email address at the bottom of the page. A winner will be randomly selected from the pool on entrants. Your chances of winning this awesome Barbie Hoverboard toy will vary based on the number of people who enter the giveaway. Be sure to enter before this super special giveaway ends on July 31! Good luck! 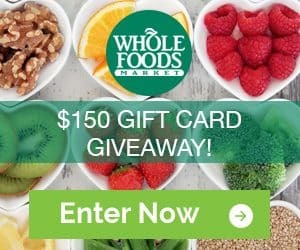 Win a Free $150 Whole Foods Gift Card When You Enter This Giveaway! Free Whole Foods Gift Card When You Enter This Giveaway! Do you shop at Whole Foods? If so, you should enter this special Whole Foods gift card giveaway! Six different winners will be selected, and each will receive a $150 Whole Foods gift card! What would you buy if you won one of the FREE gift cards?? Entering this giveaway is so simple and only takes a few seconds. To enter this awesome gift card giveaway, fill in your mailing info and your contact information. You must be a legal resident of the United States in order to enter the gift card giveaway. If you have never shopped at a Whole Foods store, you definitely MUST check one out! They exclusively sell natural foods that do not contain hydrogenated fats, artificial colors, flavors, dyes, and artificial preservatives. Obviously, it is a very health conscious place to shop. Whole Food grocery stores are located throughout the United States. How great would it be to win a $150 Whole Foods gift card that could be used to purchase healthy, natural, yet delicious foods for your family? Enter today for your chance one of the six gift cards that will be given away! Good luck, we hope you win! 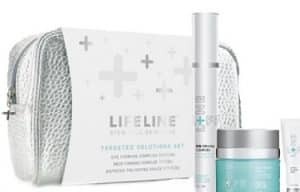 One Of Lucky Winner Will Win a LifeLine Skin Care Gift Basket Worth Nearly $300! Will It Be You?? How would you like to win a LifeLine skin care gift basket valued at nearly $300? If you enter the Lifeline Skin Care beauty giveaway, you could be the grand prize winner! You may be wondering, “What is in this skin care gift basket?” The LifeLine skin care gift set includes a 1 ounce container of Neck Firming Complex, a 0.5 ounce container of Eye Firming Complex, and a .27 ounce jar of Refresh Polishing Gelée. It also includes an adorable carrying case which is perfect for those times when you are traveling. What makes this giveaway so awesome is the incredible products that will be sent to the grand prize winner! The LifeLine products work incredible wonders on visibly aging skin and damaged skin. The skin care products are made up of a peptide formula of antioxidants and non-embryonic stem cells. This formula rejuvenates and improves the look and health of damaged skin! The effects of using these products on your skin are truly incredible. They work best on your neck, chest, and face. If you use them, you should notice wrinkle reduction, skin firming and tightening, evened out skin tone, redness reduction, and so much more. You will love the way you look when you use these products. The awesome skin care gift basket set can be yours for FREE if you win the LifeLine skin care giveaway! Your chances of winning the LifeLine giveaway will vary depending upon the number of people who enter the giveaway. To enter, just submit your email address and cross your fingers! If you are the winner, you will be notified by email. You have until August 29, 2016 to enter! Good luck!